Today we bring you a fascinating story of a man who rose up from a roadside boy to become a famous sculpture artist of the country. Famously known as Amba lal ji Modern Art Waale, Ambalal Ji hails from the district of Nagor in Rajasthan where his family is engaged in creating puppets and playing puppet shows. 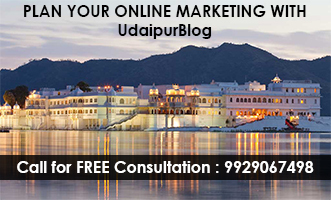 His family shifted to Udaipur when he is was a small kid, the need for employment and the want for money brought them to Udaipur. They lived on roadsides sometimes in tents and other times in the arms of the open sky carving wooden puppets and having puppet shows they earned their living. Ambalal grew among its family members learning how to carve wooden puppets which was their family occupation and the only thing which they knew to earn money. His father used to have puppet shows in Lake Palace and earn a living. As a child he was interested in puppet art forms and took interest in learning to make wooden puppets and also stone crafts. He has no ideas where his future was taking him. In his journey of his life as a teenager he met Mr. Harish Bhai Trevedi who was a marble mine owner as well as a sculpture artist. 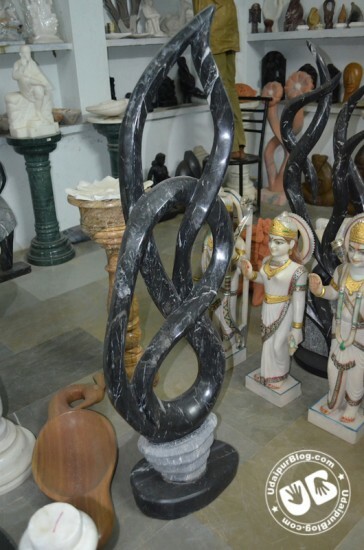 Harish Bhai taught him to make stone sculptures and got him well endowed with this art. Ambalal worked with him and learned this art for as long as 10 years and earned his living. Harish bhai was the first person to inspire him and take care of this artist. Soon Ambalal started taking part in Shilpgram fest where he ran a temporary shop where his creations where liked and purchased by many national as well as international tourists. He also took part in various cultural fests across the country and displayed his art In Goa, Ahemdabad, Jaipur and various other states. These experience and exposures helped him understand the value of his art work and he worked further more to enhance his skills and be a better artist. 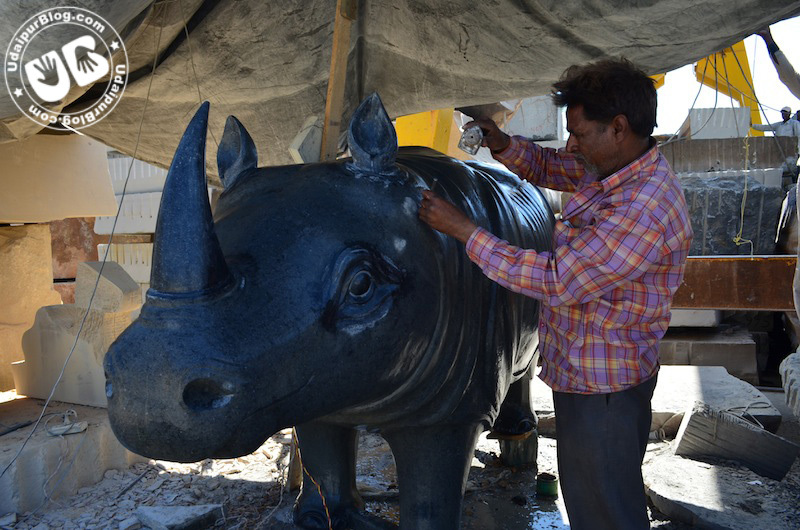 Soon he started working for various famous handicraft showrooms and export houses in the city as an employee creating sculptures. He worked for almost all the famous art houses but his art and hard work was not very much appreciated and rewarded but these business people. He was just an employee out there serving and following his master’s instructions. At times he even didn’t got his salaries on time and thus those were really a hard times for him. 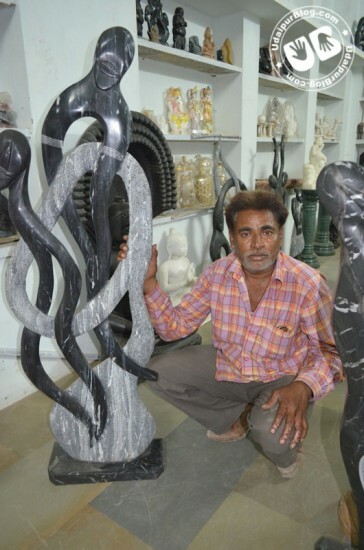 These hardships provoked him to start his own art or sculpture shop. And in the early months of the year 2011 he stated a shop near pula circle. His beautiful craftsmanship along with the strategic location of his shop proved a good luck to him and soon customers started coming in. These customers where all highway customers who were returning to their homes after their stay in Udaipur and on the way they found this shop who sold pretty artistic sculptures and art pieces. 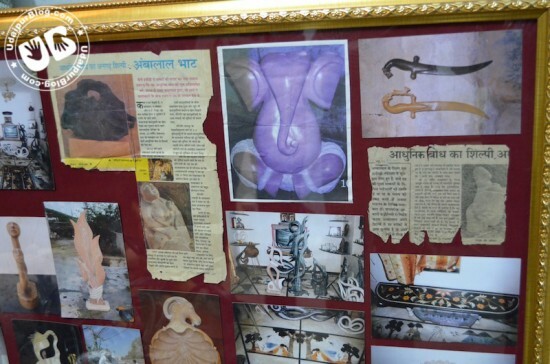 Customers from Gujrat, Maharastra and foreign tourists bought some art pieces from him as sovereigns before returning to their homes. 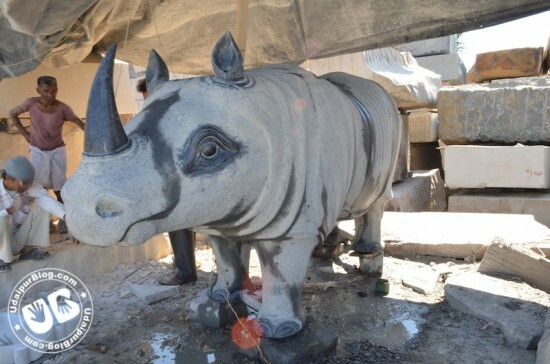 Very recently he got an order from a businessman from Gujarat for creating a giant hippopotamus of granite stone. The hippo is exact as a real hippo and is one of its kind in the country. The size and dimension of this hippo are huge i.e 5 feet tall and 10 feet and 6.5 feet in diameter. No artist from the city has ever created as a huge masterpiece with a single block of stone. He has got his family with 2 kids the elder one 15 years old and the young son is 13 years old. Unlike their father his both son’s go to school and also take a keen interest in learning this art in their free time. Presently he has got a dedicated team of craftsmen who work/learn and help him to create stone wonders. 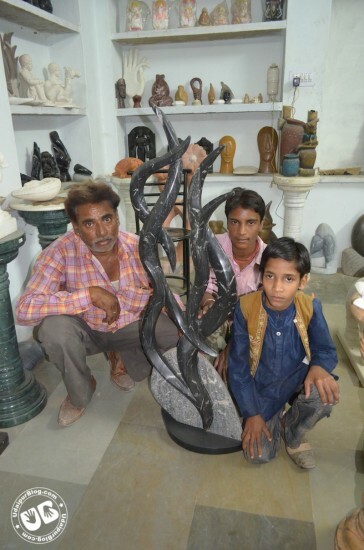 These craftsmen are not just employees to him but rather they are a family to him and he trusts them like his sons. Many art enthusiasts also come to him to learn this art and he always welcomes everyone who comes to him. If you want to learn then have no egos or attitudes. Have a childlike and selfless attitude towards people and things and the learning’s will come to you. inko inke hardwork ka result nahi mil rha hai ….